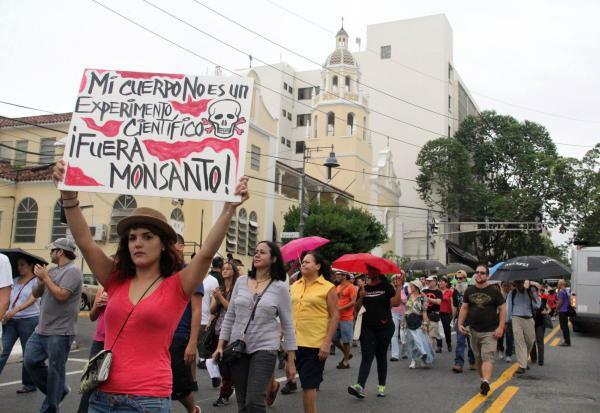 Desde su llegada a Puerto Rico en 1983, la semillera Monsanto había realizado sus extensas e intensivas operaciones de experimentación y propagación de semilla convencional y transgénica sin problema ni controversia alguna, por lo menos hasta que este servidor comenzó a publicar numerosos reportajes críticos sobre la biotecnología transgénica en las páginas del semanario Claridad y por la agencia noticiosa IPS, entre los años 1999 y 2004. ****** Mi campaña ha sido una cruzada más o menos solitaria hasta que el panorama comenzó a cambiar rápidamente en estos últimos dos años. El 16 de octubre de 2011 un grupo de activistas, agricultores y universitarios participamos del Día Mundial de Acciones contra Monsanto con una caravana educativa por los municipios de Juana Díaz, Santa Isabel y Salinas, que es donde está el grueso de los semilleros transgénicos en la isla, no solo de Monsanto sino también de Bayer, Pioneer y otras empresas. Al mes siguiente, el Centro de Periodismo Investigativo de Puerto Rico publicó una serie de reportajes titulada “El experimento caribeño de Monsanto”, escrita por Eliván Martínez, en la que, entre varios señalamientos y cuestionamientos críticos, informa que la compañía puede estar en violación de la Constitución de Puerto Rico al sembrar en unos 1,500 acres. Nuestra Constitución, en su Artículo VI, Sección 14, prohíbe que un individuo o corporación tenga sobre 500 acres de tierras agrícolas. 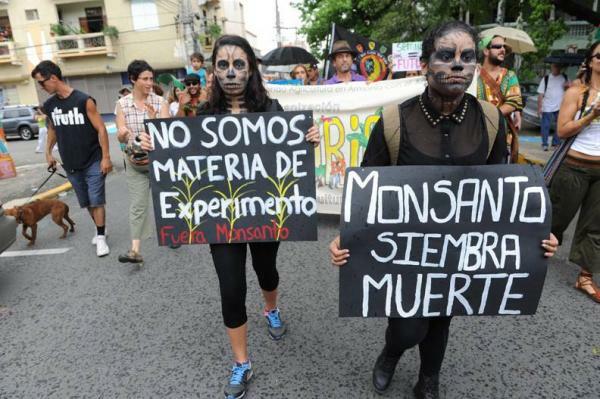 La imagen pública de Monsanto en Puerto Rico se ha ido deteriorando paulatinamente. En lo que va del año 2013 la empresa enfrenta en nuestro país varios miniescándalos. En abril un grupo de ciudadanos de todas partes de la isla protestó en la sede del Colegio de Agrónomos por un homenaje a Monsanto. 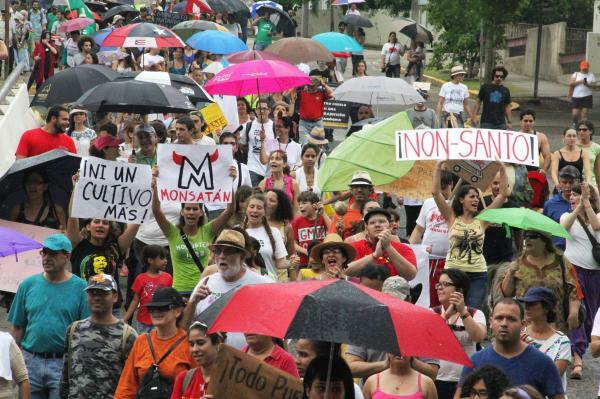 El sábado 25 de mayo, cientos de manifestantes se congregaron frente a la sede del Departamento de Agricultura de Puerto Rico en la avenida Fernández Juncos en Santurce para participar de la jornada mundial de acciones contra Monsanto, marchando hacia el Centro Minillas. Percy Schmeiser was a farmer. Shortly after the Monsanto company introduced genetically modified (GM) canola plants to Canada, Percy Schmeiser was a farmer facing a lawsuit. 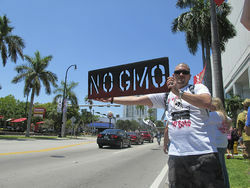 In May, more than 1,300 Miami protesters joined the global march against Monsanto. "They're a pesticide company that's bought up seed firms," says Bill Freese, of the Center for Food Safety. 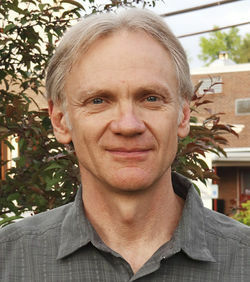 Research professor Dr. Charles Benbrook found that rapidly increasing seed and pesticide costs were tamping farmers' income. 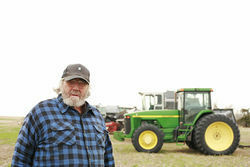 Kansas farmer Bryce Stephens had to stop growing organic corn and soybeans for fear of contamination and has 30-foot buffer crops to protect his organic wheat. 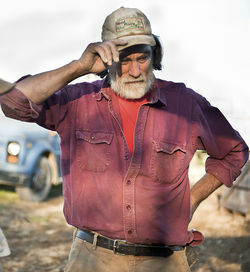 "Monsanto and the biotechs need to... keep their pollution on their side of the fence," says Maine farmer Jim Gerritsen. 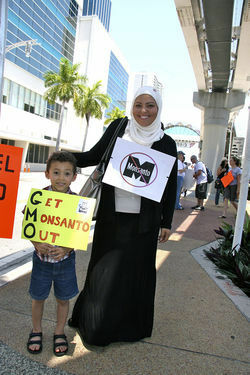 In South Florida, Monsanto protesters of all ages made their concerns known in May. After hearing that GM crops could potentially increase yields, three farmers in Schmeiser's region planted fields of Monsanto's seed. Winds pushed pollen from GM canola into Schmeiser's fields, and the plants cross-pollinated. The breed he had been cultivating for 50 years was now contaminated by Monsanto's GM canola. Schmeiser's case illustrates how Monsanto is dominating — and terrifying — the agricultural world with secretive technologies, strong-arm tactics, and government approval. En junio 2013 la Comisión de Agricultura del Senado de Puerto Rico, presidida por el senador popular Ramón Ruiz Nieves, realizó una audiencia pública en torno a un proyecto de ley para reglamentar la producción, venta y distribución de semillas en el país. Este proyecto parece seguir una tendencia preocupante en Europa y América Latina de reglamentar las semillas campesinas tradicionales y prohibir su intercambio y venta, invocando el “control de calidad” como excusa. In the heat of all of the allegations facing GMO’s, Monsanto has published no research and countered no arguments against their products. The lack of opposition makes the consumer wonder if the allegations are true, further aligning the public against Monsanto. So why has Monsanto not come to its own defense? Why have they not released statements claiming blasphemy, dissention, or defamation? Monsanto could easily change their negative perception by releasing stats or info proving the social good of their endeavors, but they haven’t. The fact that they have no evidence to prove their own innocence is worrisome. It begs the question of if they even know the effects of their work long term. They are publically attacked and have had no obvious response to their own public issues, no excuses, and most importantly no apologies. Monsanto is a testament to the difficulty of maintaining a positive public image. Amidst ongoing crisis management PR, their PR strategy seems to be a wait and act like nothing happened approach, and seem indifferent and resigned to the fact that they will be hated regardless. The US is the biggest global adopter of genetically engineered (GE) crops, of which the bulk comprises Monsanto’s Roundup Ready (RR) varieties that are tolerant to glyphosate. A recent study on herbicide-tolerant GE crops in the US examined US Department of Agriculture (USDA) and US Environmental Protection Agency (EPA) data, and has revealed that herbicide use has increased substantially since the latter half of the 90s. Alongside this, RR crops have given rise to a serious negative externality called ‘superweeds’ which are resistant to glyphosate and which cost farmers as much as USD12-50 per acre to get rid of. Although initially dropping from 1998-2001, herbicide use in the US subsequently increased by 81.2 million pounds (26%) from 2001-2010 as farmers applied more herbicides to overcome glyphosate-resistant weeds. The total volume of glyphosate applied to GE corn, cotton and soy increased ten-fold from 15 million pounds in 1996 to 159 million pounds in 2012. Glyphosate-resistant superweeds are appearing in more states across the country covering as much as 61.2 million acres. As of 2012, gyphosate-resistant waterhemp, Palmer amaranth and horseweed were found in 8, 12 and 21 states, up from 5, 8 and 12 states, respectively, 4-8 years earlier. In addition, the International Survey of Herbicide Resistant Weeds found three times as many multiple herbicide-resistant weed infestations in 2011 compared to a decade earlier. The emergence of the resistant weeds has paved the way for the introduction of 2,4-D tolerant corn and dicamba-tolerant soybean. The application of these two herbicides is expected to increase dramatically in coming years. 2,4-D is a known endocrine disruptor and dicamba is a carcinogenic herbicide. The study makes several recommendations, which include proper health evaluations of GE crops, better data collection, and the adoption of non-chemical best management practices to prevent weed resistance and control weeds on a long-term basis. The full study by Food & Water Watch can be downloaded from:documents.foodandwaterwatch.org/doc/Superweeds.pdf‎. Plagued by a growing army of Roundup-resistant superweeds and Bt-resistant superpests spreading across the country, a full 49 percent of American farmers are now frantically trying to kill these superweeds and pests with ever-larger quantities of toxic pesticides, herbicides and fungicides including glyphosate (Roundup), glufosinate, 2,4D (“Agent Orange’), dicamba, and neonicotinoids (insecticides linked to massive deaths of honey bees). The consumer, farmer and fishing community insurgency that frightens Monsanto and its allies the most is the upcoming ballot initiative (I-522) in Washington State on Nov. 5. As Monsanto and its allies, such as the Grocery Manufacturers Association (GMA) understand, this is the most crucial battle against GMOs today. 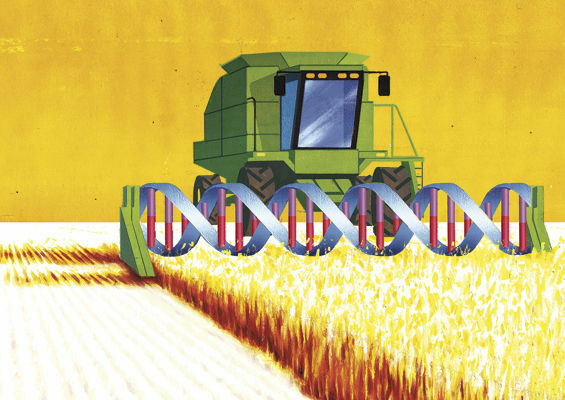 If voters pass mandatory labeling in Washington, reinforced by contingent state labeling laws already passed or in progress in Connecticut, Maine and Vermont, it will mean the end of the road for genetically engineered food in U.S. grocery stores. Y fuera de Puerto Rico le va igual o peor. El pasado 9 de julio la National Public Radio (NPR) de Estados Unidos transmitió un reportaje sobre las superplagas que azotan los sembradíos transgénicos (7), y en mayo el Wall Street Journal publicó un artículo con el horripilante título de "Pesticides Make a Comeback: Many Corn Farmers Go Back to Using Chemicals as Mother Nature Outwits Genetically Modified Seeds" (8). Como señala el agricultor periodista Tom Philpott en un artículo sobre el desastre de relaciones públicas de Monsanto en la página web deMother Jones, lo más significativo de esto es que NPR y el Wall Street Journal siempre habían estado sesgados a favor de los transgénicos en reportajes anteriores (9). It appears that farmers have gotten part of the message: Biotechnology alone will not solve their rootworm problems. But instead of shifting away from those corn hybrids, or from corn altogether, many are doubling down on insect-fighting technology, deploying more chemical pesticides than before. Companies like or that sell soil insecticides for use in corn fields are reporting huge increases in sales: 50 or even 100 percent over the past two years. And this, from a veteran observer of the GMO-seed industry who—in my view—sometimes errs on the side of being too soft on it. When the fresh wheat samples arrived at her lab this spring, Carol Mallory-Smith, a weed scientist, didn’t know what to expect. The concerned farmer who sent them had contacted her because a patch of wheat had refused to die after being treated with a powerful herbicide called Roundup. 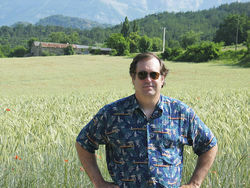 “The farmer asked me if the wheat could have evolved a natural resistance to the herbicide,” says Mallory-Smith, “but I said that that wasn’t possible because of the way wheat is exposed to Roundup.” Then the grower mentioned the possibility that Monsanto’s genetically modified wheat seeds might have made their way into the field somehow.